There is a stillness about Steven Outram''s paintings. We are invited to stop and contemplate the beauty of the world around us. Outram''s contemporary oil paintings are uncomplicated and have a purity and honesty which makes them fresh and interesting. 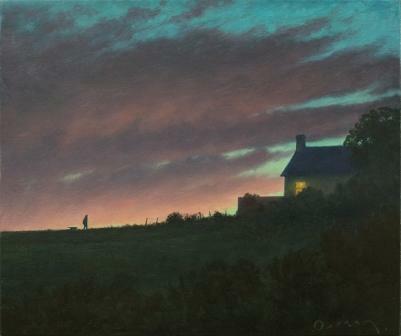 In ''The Unexpected Glow'', Steven Outram paints a figure and his dog returning home, silhouetted by a huge and dramatic sunset. Glorious soft red tinged clouds cross the sky and even the little we can see of the earth below is curved, echoing the curve of the glowing sun. There is a very real sense of peace in this painting. This impression is reinforced by the limited palette of colours used and Outram''s use of contrasting light and dark spaces. In addition to Red Rag British Art Gallery Steven Outram has exhibited at other leading British Art Galleries. Each painting at Red Rag is sourced from the Steven Outram artist studio and like all Red Rag British art and Contemporary art it can be shipped worldwide. Click here to view more contemporary paintings by Steven OUTRAM.